Continuing my series of posting ten-year-old photos, I was struck by the fact that many of the photos from April 2004 show some things have changed very little. 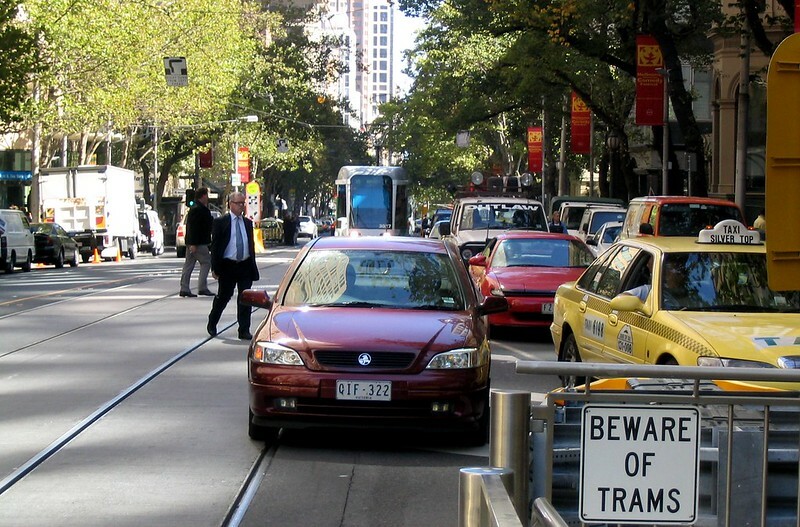 Traffic in Collins Street, creeping into the tram lanes. Just recently more visible dividers have been added… I suspect they help, but don’t completely prevent cars on the tracks. Spirit of Tasmania, seen from South Melbourne Beach. Looking closely, it might be Spirit of Tasmania II. According to Wikipedia, it seems both I and II were built in 1998, and originally served connecting Greece with Italy, though it seems II was involved in a fatal accident in 1999, some years before being brought to Australia. 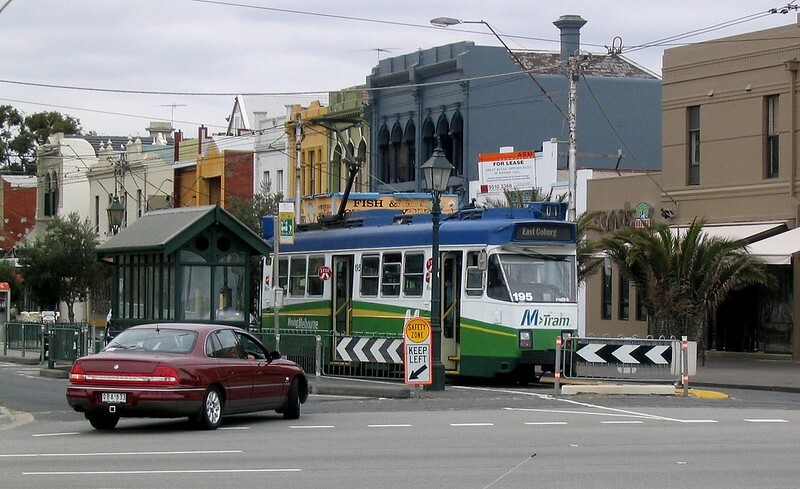 Who remembers the M>Tram livery? A little garish perhaps, but in some ways not so different to the new PTV livery. And I did like the “Moving Melbourne” slogan. 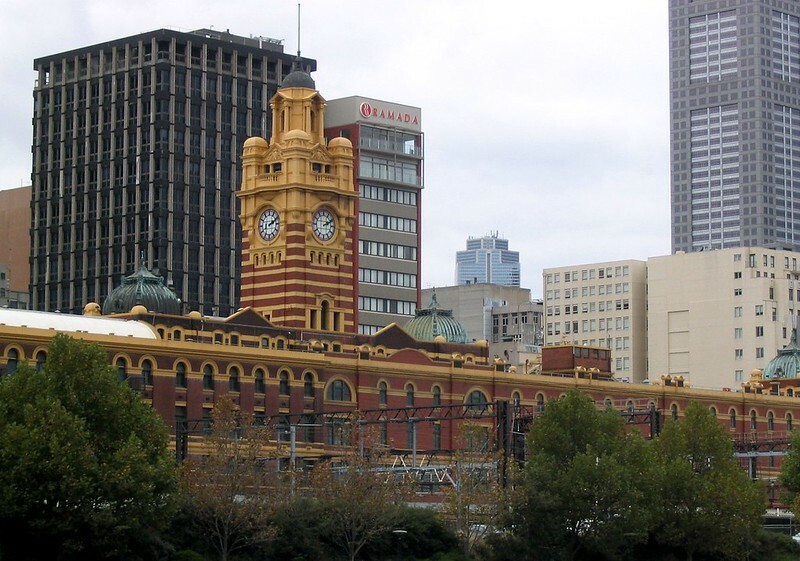 Flinders Street Station, as seen from Southbank. Thanks to height limits around Swanston Street, I’m not even sure the skyline from this angle has changed very much. 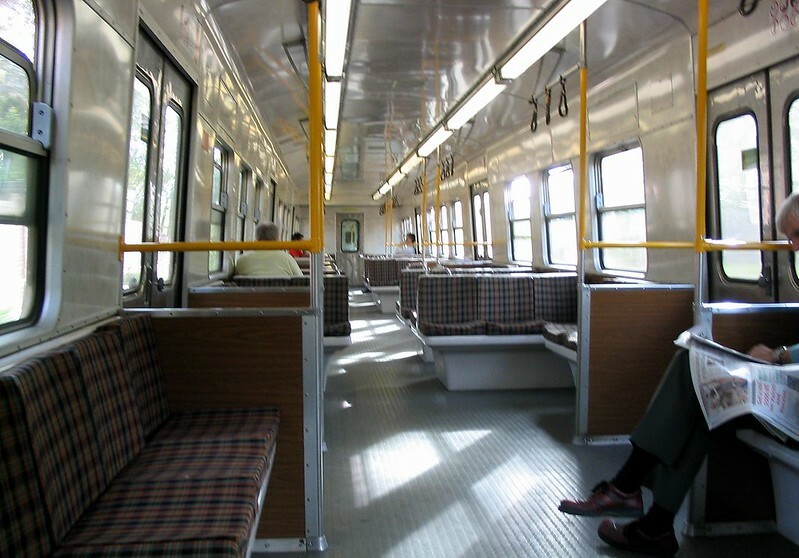 Interior of a Hitachi train — odds on it’s one of those scrapped in the mid-2000s, as only about 7 are still around (and not in service at present). Obviously this wasn’t a busy service — the timestamp says it was 9:14am on Wednesday 14th April 2004. 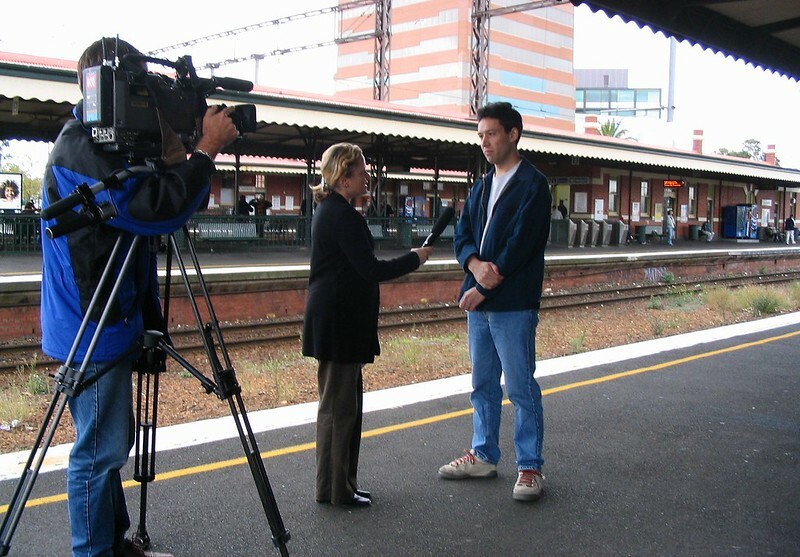 Being interviewed for ABC TV News on 18th April — this was the day Connex took over the entire metropolitan rail network. 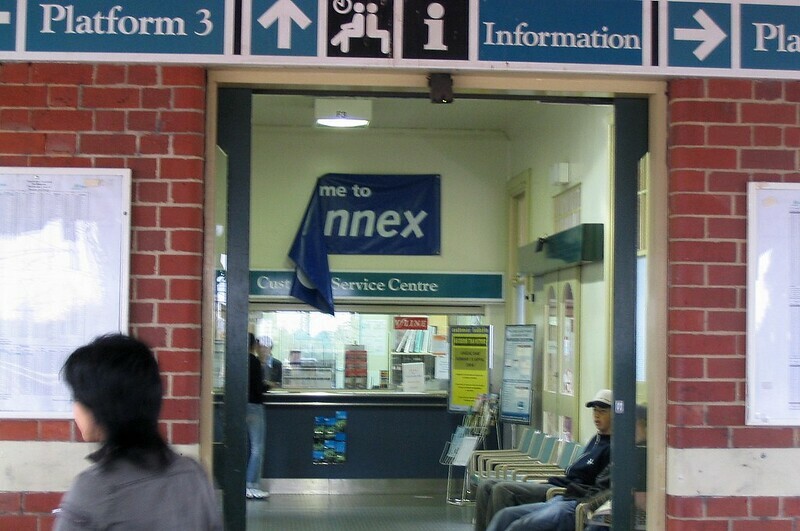 …unfortunately the Connex banner at Caulfield decided to rebel against its new overlords. Traffic in Collins Street near Swanston Street. Yep, not changed much. If you want to move quickly in this area, don’t bring a motor vehicle. Nice pics as usual, thanks. I’m not sure the Ramada is still there? Anyone know, or what it is called now? Some things have changed – why, it would appear that someone’s driving a large Australian-made car in that M>Tram photo! On the Frankston line at this time, that’s still a frequent view. Quite the opposite on the Cranbourne/Pakenham line at the same time of day! The ‘clickbait’ issue deserves a blog article in its own right, doesn’t it?! It’s ruining the Internet, and journalism. I almost miss the old hitachi trains. They smelt horrible but I rather liked the way the seats were arranged. The only real issue with the Hitachi trains was how hot they got on a hot day. Needed airconditioning. I wonder if they should have mothballed the fleet for a little while longer than what they did. If so, then we would have been getting quite a lot more than 8 Xtraps in this coming order. I would say that the M>Tram livery was better and brighter than the Yarra Trams livery of the time. 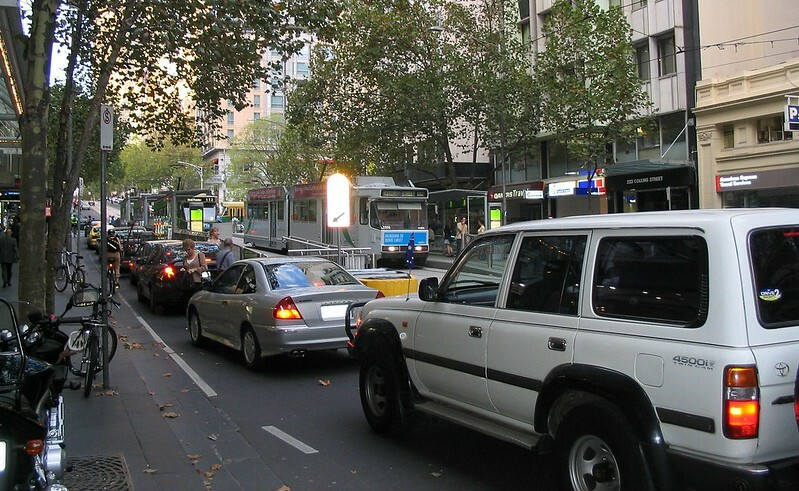 I echo what Daniel said about Collins Street, Collins Street is a no-go zone for automobiles. I still feel that it would have been better to have done Bourke street than do Collins Street with them platform stops. Some nice works have been done since, Suburban trains to Sunbury and South Morang. Off the top of my head, I would guess Craigiburn too?? The RFR would have been just after 2004, and no one can understate the major advantage that project has been. Ok that shall be enough from me until next month. Ramada is quite an interesting point to raise… although I was very young in 2004, I have always recalled that building as Citigate. I believe to date it is still Citigate, with the branding of its parent company Mirvac.